Today, I took my 7 year old son along with the “Senior Saints” from our church to visit the Creation Museum in Covington, Kentucky (Near Cincinnati). The drive is only an hour from our church and we’re doing the Answers In Genesis Vacation Bible School this year. So, I thought I would make the trip. 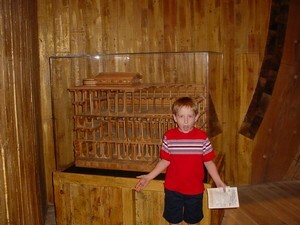 From the start I was very impressed with the level of technology and sophistication of the Creation Museum. All the exhibits were very well done, often using world class technology to present their solutions for the Bible versus Science questions. Everyone from our group was also impressed and several are making plans to come back with their grandchildren. My 1st grade son was very interested, although he doesn’t have much interest in Evolution. At this point he simply says, “Dad, that apes turning into people stuff is so old, it doesn’t even make sense.” I have assured him that many people really have problems believing the Bible, he just doesn’t get it. I guess this is the beauty of a childlike faith. Throughout the Creation Museum there were audio video presentations that added to the immersion learning environment. The dinosaurs moved, as did several of the biblical characters. Their overview of Bible history was compelling and held the whole time line of history together. Some might object to the Creation Museum’s strictly young earth interpretation of Genesis, but I was glad to see them taking the Bible at face value on those issues. It took our group three hours, which was probably a little short. I would say younger children would not be as enraptured with the museum as my son, although several families did have kids in strollers. 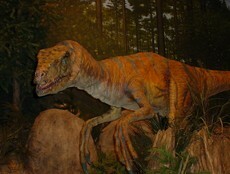 If you are in the Cincinnati area, you should visit the Creation Museum.